The Septuagint: A page from Codex vaticanus, the basis of Sir Lancelot Brenton's English translation. The Septuagint (or simply "LXX") is the name commonly given in the West to the ancient, Koine Greek version of the Hebrew Bible (often called the "Old Testament") translated in stages between the third to first century B.C.E. in Alexandria. It is the oldest of several ancient translations of the Hebrew Bible into Greek. The name means "seventy" and derives from a tradition that seventy-two Jewish scholars (LXX being the nearest round number) translated the Torah from Hebrew into Greek for one of the Ptolemaic kings. The LXX was held with great respect in ancient times; Philo and Josephus ascribed divine inspiration to its authors. It formed the basis of the Old Latin versions and is still used intact within Eastern Orthodoxy. Furthermore, the LXX was also the basis for Gothic, Slavonic, old Syriac (but not the Peshitta), old Armenian, and Coptic versions of the Old Testament. Of significance for all Christians and for Bible scholars, the LXX is quoted by the Christian New Testament and by the Apostolic Fathers. While Jews have not used the LXX in worship or religious study since the second century C.E., recent scholarship has brought renewed interest in it in Judaic studies. Some of the Dead Sea Scrolls attest to Hebrew texts other than those on which the Masoretic Text was based; in many cases, these newly found texts accord with the LXX version. Also, the LXX version of some works, like Daniel and Esther, are longer than the Hebrew. The oldest surviving codices of LXX date to the fourth century C.E. The Septuagint derives its name from the Latin phrase septuaginta interpretum versio, "translation of the seventy interpreters" (hence the abbreviation LXX). The Latin title refers to a legendary account in the spurious Letter of Aristeas of how seventy-two Jewish scholars were asked by the Greek King of Egypt Ptolemy II Philadelphus in the third century B.C.E. to translate the Torah for inclusion in the Library of Alexandria. A later version of that legend narrated by Philo of Alexandria states that although the translators were kept in separate chambers, they all produced identical versions of the text in seventy-two days. Although this story is widely viewed as implausible today, it underlines the fact that some ancient Jews wished to present the translation as authoritative. A version of this legend is found in the Tractate Megillah of the Babylonian Talmud (pages 9a–9b), which identifies 15 specific unusual translations made by the scholars. Only two of these translations are found in the extant LXX. Modern scholarship holds that the LXX, beginning with the Pentateuch, was written during the third through first centuries B.C.E. Later Jewish revisions and recensions of the Greek against the Hebrew are well attested, the most famous of which include the Three: Aquila (ca. 128 C.E. ), Symmachus, and Theodotion. The Three, to varying degrees, are more literal renderings of their contemporary Hebrew scriptures as compared to the Old Greek. Modern scholars consider one or more of the Three to be totally new Greek versions of the Hebrew Bible. In around 235 C.E., Origen, a Christian scholar in Alexandria, completed the Hexapla, a comprehensive comparison of the ancient versions side-by-side in six columns. Much of this work was lost, but several compilations of the fragments are available. In the first column was the contemporary Hebrew, in the second a Greek transliteration of it, then the newer Greek versions each in their own columns. Origen also kept a column for the Old Greek (the Septuagint) and next to it was a critical apparatus combining readings from all the Greek versions with editor's marks indicating to which version each stitch belonged. Perhaps only three copies of the voluminous Hexapla were ever made, but Origen's combined text was copied, eventually without the editing marks, and the older uncombined text of the LXX was neglected. Thus this combined text became the first major Christian recension of the LXX, often called the Hexaplar recension. In the centuries following Origen, two other major recensions were made by Lucian and Hesychius. The oldest manuscripts of the LXX include second century B.C.E. fragments of Leviticus and Deuteronomy (Rahlfs nos. 801, 819, and 957), and first century B.C.E. fragments of Genesis, Exodus, Leviticus, Numbers, Deuteronomy, and the Minor Prophets (Rahlfs nos. 802, 803, 805, 848, 942, and 943). Relatively complete manuscripts of the LXX postdate the Hexaplar recension and include the Codex Vaticanus and the Codex Sinaiticus of the fourth century and the Codex Alexandrinus of the fifth century. These are indeed the oldest surviving nearly complete manuscripts of the Old Testament in any language; the oldest extant complete Hebrew texts date 700 years later, from around 1000. While there are differences between these three codices, scholarly consensus today holds that one LXX—that is, the original pre-Christian translation—underlies all three. The various Jewish and later Christian revisions and recensions are largely responsible for the divergence of the codices. The sources of the many differences between the Septuagint and the Masoretic Text (MT) have long been discussed by scholars. The most widely accepted view today is that the Septuagint provides a reasonably accurate record of an early Semitic textual variant, now lost, that differed from precursors of the Masoretic Text. Ancient scholars, however, did not suspect this. Early Christians—who were largely unfamiliar with Hebrew texts, and were thus only made aware of the differences through the newer Greek versions—tended to dismiss the differences as a product of uninspired translation of the Hebrew in these new versions. Following the Renaissance, a common opinion among some humanists was that the LXX translators bungled the translation from the Hebrew and that the LXX became more corrupt with time. The discovery of many fragments in the Dead Sea Scrolls that agree with the Septuagint rather than the Masoretic Text proved that many of the variants in Greek were also present in early Semitic manuscripts. Hast thou not sinned if thou hast brought it rightly, but not rightly divided it? Be still, to thee shall be his submission, and thou shalt rule over him. Surely, if you improve yourself, you will be forgiven. But if you do not improve yourself, sin rests at the door. Its desire is toward you, yet you can conquer it. This instance illustrates the complexity of assessing differences between the LXX and the Masoretic Text. Despite the striking divergence of meaning here between the two, nearly identical consonantal Hebrew source texts can be reconstructed. The readily apparent semantic differences result from alternative strategies for interpreting the difficult verse and relate to differences in vowelization and punctuation of the consonantal text. The differences between the LXX and the MT thus fall into four categories. 1. Different Hebrew sources for the MT and the LXX. Evidence of this can be found throughout the Old Testament. Most obvious are major differences in Jeremiah and Job, where the LXX is much shorter and chapters appear in different order than in the MT, and Esther where almost one third of the verses in the LXX text have no parallel in the MT. A more subtle example may be found in Isaiah 36.11; the meaning ultimately remains the same, but the choice of words evidences a different text. The MT reads: "...al tedaber yehudit be-'ozne ha`am al ha-homa" ("speak not the Judean language in the ears of [or: which can be heard by] the people on the wall"). The same verse in the LXX reads according to the translation of Brenton: "and speak not to us in the Jewish tongue: and wherefore speakest thou in the ears of the men on the wall." The MT reads "people" where the LXX reads "men." This difference is very minor and does not affect the meaning of the verse. Scholars at one time had used discrepancies such as this to claim that the LXX was a poor translation of the Hebrew original. With the discovery of the Dead Sea Scrolls, variant Hebrew texts of the Bible were found. In fact this verse is found in Qumran (1QIsaa) where the Hebrew word haanashim (the men) is found in place of haam (the people). This discovery, and others like it, showed that even seemingly minor differences of translation could be the result of variant Hebrew source texts. 2. Differences in interpretation stemming from the same Hebrew text. A good example is Genesis 4:7 shown above. 3. Differences as a result of idiomatic translation issues (i.e., a Hebrew idiom may not easily translate into Greek, thus some difference is intentionally or unintentionally imparted). For example, in Psalm 47:10 the MT reads: "The shields of the earth belong to God." The LXX reads: "To God are the mighty ones of the earth." The metaphor "shields" would not have made much sense to a Greek speaker; thus the words "mighty ones" are substituted in order to retain the original meaning. Although the integrity of the Septuagint as a text distinct from the Masoretic is upheld by Dead Sea Scroll evidence, the LXX does show signs of age in that textual variants are attested. There is at least one highly unreliable complete text of the LXX, Codex Alexandrinus. The whole Septuagint is also found in the Codex Vaticanus and Codex Sinaiticus, which do not perfectly coincide. But the LXX is a particularly excellent text when compared to other ancient works with textual variants. To reject the existence of a Septuagint merely on the basis of variation due to editorial recension and typographical error is unjustified. The title "Septuagint" is of course not to be confused with the seven or more other Greek versions of the Old Testament, most of which do not survive except as fragments. These other Greek versions were once in side-by-side columns of Origen's Hexapla, now almost wholly lost. Of these the most important are "the Three": Those by Aquila, Symmachus, and Theodotion, which are identified by particular Semiticisms and placement of Hebrew and Aramaic characters within their Greek texts. One of two Old Greek texts of the Book of Daniel has been recently rediscovered and work is ongoing in reconstructing the original form of the Septuagint as a whole. By the third century B.C.E., the Jewish community was situated primarily within the Hellenistic world. Outside Judea, many Jews may have needed synagogue readings or texts for religious study to be interpreted into Greek, producing a need for the LXX. Judaism at this time was also searching for and receiving converts who would mostly have been Greek speaking. Alexandria held the greatest diaspora Jewish community of the age and was also a great center of Greek letters. Alexandria is thus likely the site of LXX authorship, a notion supported by the legend of Ptolemy and the 72 scholars. The Septuagint enjoyed widespread use in the Hellenistic Jewish diaspora and even in Jerusalem, which had become a rather cosmopolitan (and therefore Greek-speaking) town. Both Philo and Josephus show a reliance on the Septuagint in their citations of Jewish scripture. Starting approximately in the second century C.E., several factors led most Jews to abandon the LXX. Christians naturally used the LXX since it was the only Greek version available to the earliest Christians. In addition, Christians, as a group, had rapidly become overwhelmingly gentile and, therefore, unfamiliar with Hebrew. The association of the LXX with a rival religion may have rendered it suspect in the eyes of the newer generation of Jews and Jewish scholars. Perhaps more importantly, the Greek language—and therefore the Greek Bible—declined among Jews after most of them fled from the Greek-speaking eastern Roman Empire into the Aramaic-speaking Persian Empire when Jerusalem was destroyed by the Romans. Instead, Jews used Hebrew/Aramaic manuscripts later compiled by the Masoretes, and authoritative Aramaic translations, such as those of Onkelos and Rabbi Yonathan ben Uziel. What was perhaps most significant for the LXX, as distinct from other Greek versions, was that the LXX began to lose Jewish sanction after differences between it and contemporary Hebrew scriptures were discovered. Even Greek-speaking Jews—such as those remaining in Palestine—tended less to the LXX, preferring other Jewish versions in Greek, such as that of Aquila, which seemed to be more concordant with contemporary Hebrew texts. The early Christian Church continued to use the Old Greek texts since Greek was the lingua franca of the Roman Empire at the time and the language of the Church, and because the Church Fathers tended to accept Philo's account of the LXX's miraculous and inspired origin. When Jerome undertook the revision of the Old Latin translation of the Septuagint, he checked the Septuagint against the Hebrew that was then available. He came to believe that the Hebrew text better testified to Christ than the Septuagint. He broke with church tradition and translated most of the Old Testament of his Vulgate from Hebrew rather than Greek. His choice was severely criticized by his contemporaries. The Hebrew text diverges in some passages that Christians hold to prophesy Christ, and the Eastern Orthodox Church still prefers to use the LXX as the basis for translating the Old Testament into other languages. The Orthodox Church of Constantinople, the Church of Greece, and the Cypriot Orthodox Church continue to use it in their liturgy today, untranslated. Many modern critical translations of the Old Testament, while using the Masoretic Text as their basis, consult the Septuagint as well as other versions in an attempt to reconstruct the meaning of the Hebrew text whenever the latter is unclear, undeniably corrupt, or ambiguous. Many of the oldest Biblical verses among the Dead Sea Scrolls, particularly those in Aramaic, correspond more closely with the LXX than with the Masoretic Text. This tells us that there were originally several different Hebrew texts and that the LXX represents a separate tradition from that which was standardized as the Masoretic tradition by ca. 990 C.E. Thus, not all manuscripts discovered at Qumran agree with each other. The majority agree with the Masoretic tradition in contrast to the Septuagint. Some sections of the Septuagint may show Semiticisms, or idioms and phrases based on Semitic languages like Hebrew and Aramaic. Other books, such as LXX Daniel and Proverbs, show Greek influence more strongly. The book of Daniel that is found in almost all Greek Bibles, however, is not from the LXX, but rather from Theodotion's translation, which more closely resembles the Masoretic "Daniel." The LXX is also useful for elucidating pre-Masoretic Hebrew: Many proper nouns are spelled out with Greek vowels in the LXX, while contemporary Hebrew texts lacked vowel pointing. While the "sh" sibilant was by convention spelled with a sigma ("s"), ancient Greek texts are useful for pronouncing names and titles of books. See also Table of books below. The order of books in the Septuagint does not always coincide with the presentation of the Masoretic Text. The Books of Samuel and the Books of Kings are combined in the LXX in one book in four parts called Βασιλειῶν ("Of Reigns"); scholars believe that this is the original arrangement before the book was divided for readability. In LXX, the Books of Chronicles supplement Reigns and it is called Paraleipoménon (Παραλειπομένων—things left out). The Septuagint organizes the minor prophets as twelve parts of one Book of Twelve. In addition, some scriptures of ancient origin are found in the Septuagint but are not present in the Hebrew. These include additions to Daniel and Esther. 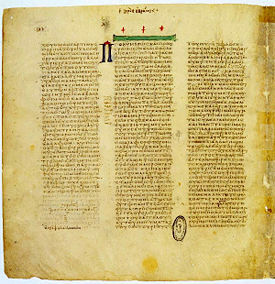 Moreover, the New Testament may include additional materials not found in the Septuagint such as Tobias, Judith, Wisdom of Solomon, Wisdom of Jesus Seirach, Baruch, Epistle of Jeremy (sometimes considered part of Baruch), additions to Daniel (The Prayer of Azarias, the Song of the Three Children, Sosanna and Bel and the Dragon), additions to Book of Esther, 1 Maccabees, 2 Maccabees, 3 Maccabees, 4 Maccabees, 1 Esdras, Odes, including the Prayer of Manasses, and Psalm 151. The editio princeps is the Complutensian Polyglot. It was from Origen's hexaplar recension. Printed in 1514–18, it was not published until it appeared in the Polyglot of Cardinal Ximenes in 1520. The Aldine edition (begun by Aldus Manutius) appeared at Venice in 1518. The text is closer to Codex B than the Computensian. The editor says he collated ancient manuscripts but does not specify them. It has been reprinted several times. The most important edition is the Roman or Sixtine, which reproduces the Codex Vaticanus almost exclusively. It was published under the direction of Cardinal Caraffa, with the help of various savants, in 1586, by the authority of Sixtus V, to assist the revisers who were preparing the Latin Vulgate edition ordered by the Council of Trent. It has become the textus receptus of the Greek Old Testament and has had many new editions, such as that of Holmes and Pearsons (Oxford, 1798–1827), the seven editions of Tischendorf, which appeared at Leipzig between 1850 and 1887, the last two, published after the death of the author and revised by Nestle, the four editions of Swete (Cambridge, 1887–95, 1901, 1909), etc. Grabe's edition was published at Oxford, from 1707 to 1720, and reproduced, but imperfectly, the Codex Alexandrinus of London. For partial editions, see Vigouroux, Dict. de la Bible, 1643 sqq. The Septuagint has been translated into English. Most notable is Brenton's English translation of the Septuagint, based primarily upon Codex Vaticanus. More recently, Brenton's translation has been used as the inspiration for a modern-language version, by Paul Esposito, The Apostles' Bible. Further, Peter A. Papoutsis has translated a substantial amount of the Septuagint into English in his translation called The Holy Orthodox Bible. This translation is based on Greek Orthodox Biblical and Liturgical texts of the Septuagint as used in The Holy Orthodox Church. NOTE: LXX=Septuagint, MT=Masoretic Text. To these books of the old Greek LXX were added the Anagignoskomena before the time of Christ. This table does not attempt a verse-mapping of texts. ↑ Rick Grant Jones, Various Religious Topics, "Books of the Septuagint." Retrieved September 5, 2006. ↑ Jerome, From Jerome, Letter LXXI (404 C.E. ), NPNF1-01. The Confessions and Letters of St. Augustin, with a Sketch of his Life and Work, Phillip Schaff, ed. Retrieved November 9, 2008. ↑ Jones, Table: Dead Sea Scrolls-Septuagint Alignments Against the Masoretic Text. Retrieved November 9, 2008. ↑ William Priestly, "The Dead Sea Scrolls". Retrieved November 9, 2008. ↑ Jerome's Prologue to Genesis. Retrieved November 9, 2008. ↑ Karen Jobes and Moises Silva, Invitation to the Septuagint (Paternoster Press, 2001). ISBN 1-84227-061-3. This is the current standard for introductory works on the Septuagint. ↑ Timothy McLay, The Use of the Septuagint in New Testament Research. ISBN 0-8028-6091-5. This is the current standard introduction on the NT and LXX. ↑ William Priestly, "The Dead Sea Scrolls." A detailed explanation with scholarly apparatus. Retrieved November 11, 2008. ↑ Trent C. Butler, Chad Brand, Charles Draper, and Archie England, eds., Holman Illustrated Bible Dictionary. ↑ Allabouttruth.org, "Septuagint, Part II." Represents an evangelical Christian point of view. Retrieved November 11, 2008. ↑ Review of Joel M. Hoffman, In the Beginning: A Short History of the Hebrew Language, Book Review,, 2004. Retrieved November 11, 2008. ↑ Βασιλειῶν (Basileiōn) is the genitive plural of Βασιλεῖα (Basileia). ↑ Also called Τωβείτ or Τωβίθ in some editions. This name has been challenged. See Talk:Septuagint#Call_For_Help and Talk:Septuagint#Tobit_vs_Tobias. ↑ Obdiou is genitive from "The vision of Obdias," which opens the book. English typically simplifies the Greek ending -ias to -y, as in Jeremy, Zachary, Toby, etc, and thus "Obdy." The Septuagint Online - Comprehensive site with scholarly discussion and links to texts and translations. Catholic Encyclopedia: Versions of the Bible. Codex: Resources and Links Relating to the Septuagint. Septuagint published by the Church of Greece. Plain text of the whole LXX, including the anagignoskomena. Bible Resource Pages - contains Septuagint texts (with diacritics) side-by-side with English translations. Greek text - Complete Greek text (no diacritics, needs special font) hyperlinked to Strong's concordance. Anagignoskomena do not display. A recent interlinear edition of the Septuagint and Greek New Testament (monotonic, GIF images). The Septuagint LXX: Greek and English partial version of Brenton's edition, wiki text and PNG images. (difficult navigation). The New English Translation of the Septuagint (NETS), preliminary edition. The Holy Orthodox Bible, another English translation project of the Septuagint using Greek Orthodox texts of the Septuagint. A recent interlinear translation of the Septuagint and UBS version of Greek New Testament into Russian. Septuagint references in NT by John Salza. This page was last modified on 8 September 2015, at 17:18.